What are sleep apnea mouthpieces? 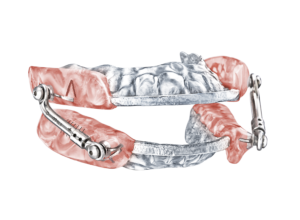 Sleep apnea mouthpieces are dentally modifiable devices that help to position the jaw during sleep. This position keeps the patient’s airway open and helps to combat symptoms of obstructive sleep apnea (OSA). If you suffer from sleep apnea or frequent snoring, these appliances could be the solution that you have been looking for, especially as an alternative to a CPAP machine. How are dental sleep appliances fit to my mouth? Sleep appliances are fit to your mouth by creating an impression of your teeth. These impressions are no different than typical impressions taken for many of the dental procedures you have experienced throughout your life and can be taken at your dentist office in just a few minutes. When the dentist removes the tray from your mouth, they’ll have an exact match of your bite, which they will use to form a mouthpiece through a combination of wire reinforcements and medical grade plastic. With a bit of fine tuning by your Friendly Smiles dental team, you’ll have a custom fit mouthpiece to be used while you sleep. The best part about a modifiable mouthpiece; they change as your mouth changes. If you have a tooth filled, your dentist will be able to re-fit your current mouthpiece to your new bite. How do dental mouthpieces differ from over the counter options? There are a lot of over the counter mouthpiece options that are meant to treat snoring, but these appliances are not fit to your mouth by a dental professional. Additionally, an at-home sleep study is recommended to inform the treatment with your device, so getting your appliance from your dentist is recommended. Friendly Smiles partners with Blackstone Medical Services to administer your sleep study in the comfort of your own home. Once you have your consultation in the office, Blackstone will deliver the sleep study supplies to your home. Then, you’ll be able to hook the equipment up and complete the test on your own terms. When you are finished, just pack up the equipment and send it back. Too easy! How do sleep apnea mouthpieces treat obstructive sleep apnea? Sleep appliances are worn while you are asleep. When worn, the appliance positions your jaw at an angle that opens your airway. This subtle repositioning can be the difference between struggling to breath during sleep and finally getting a full night of shut eye. We know, it seems a little weird. If you have sleep apnea and are treating your condition with a CPAP machine, you must be wondering how a plastic mouthpiece can provide you with the same relief. A sleep mouthpiece improves upon the fundamental flaws of a CPAP machine to bring you relief with a lot less hassle. Why are mouthpieces preferred over the CPAP machine? Sleep apnea mouthpieces are not as bulky as a CPAP machine. This makes them a great alternative for folks who are always on the go. Sleep apnea mouthpieces are easy to clean, while CPAP machines are notorious for giving the wearer infections since there are so many moving parts. If not cleaned properly, the tubing and water reservoir in the machine can start to grow bacteria. Using a mouthpiece for sleep apnea is much easier on your partner. You might not know it, but your partner is probably getting tired of the noise your CPAP makes during the night. No more tubes or cables! If you wear a CPAP, you know how intrusive the wires and tubing can be when you are trying to sleep. Imagine what a night of sleep would be without them! Want to learn more about mouthpieces for sleep apnea and whether they could be right for you? Book a free consultation with one of our gentle dentists to find out if you’d be a good candidate. To speak with the Friendly Smiles team about your options, request an appointment online or call us today to schedule an appointment at one of our 4 convenient locations. ← What is Oral Sedation?